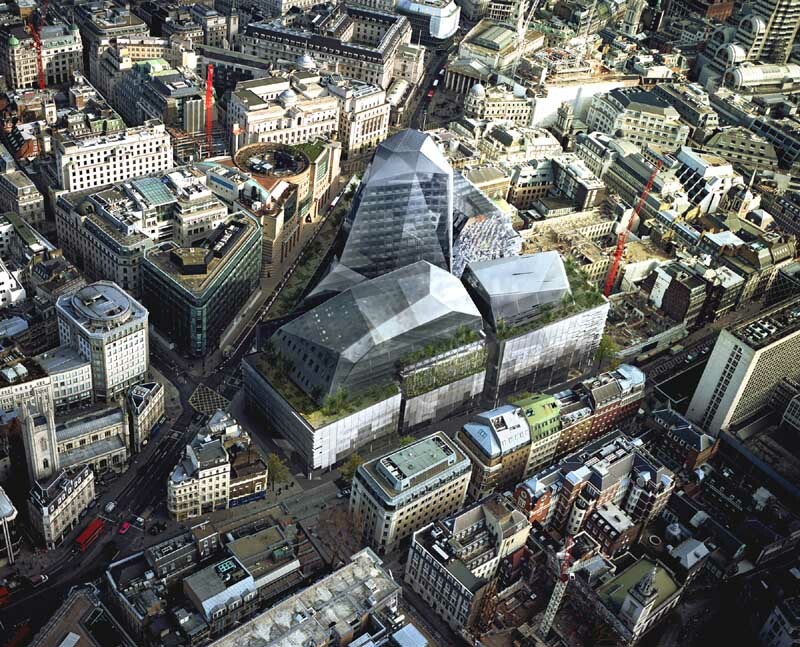 This is Bloomberg’s new London headquarters – a billion pound building that brings the financial firm’s staff from several locations into one site, and which also means a number of other offices are now looking for new tenants. The 10-storey building replaces the unlamented 1960s Bucklersbury House which took over two blocks of shops and offices that were badly damaged during WW2. What gave the site a certain fame for a generic 1960s office block was the unexpected discovery of the Temple of Mithras in the basement. More about that later. The former site was two blocks, separated by a road that followed the ancient Watling Street, an ancient route that was later improved by the Romans and ran from Dover through London to Wales. The new Bloomberg Building has restored the impression of two separate blocks, and put a covered alleyway between the two along the line of the lost road, thus restoring an ancient walkway, albeit as a pseudo-public space rather than as a public right of way. It’s also been named Bloomberg Place, which is probably a lost opportunity to drop a bit of heritage into the modern block by reusing its Roman name. That’s a tad churlish of your correspondent though as Bloomberg have been very generous elsewhere, with a restored Temple of Mithras opening next month, and a lot of support offered to archeologists when rather unexpectedly they found a large number of Roman finds in a corner of the building site. It had been presumed that most of the Roman remains had been lost in the 1960s clearance. The restored road though will be lined, in part with cafes that are deemed suitable for people on Bloomberg salaries. That means lots of fancy cafes and rather less Greggs. The building itself lacks a canteen area as it has been designed to encourage staff to go outside and frequent the local shops. That alleviates one of the problems with big companies taking over large sites, in that they internalise all the facilities, such as gyms and restaurants, meaning occupants have little reason to leave the building and wander around the locality. One of the other defining features at ground level are the slatted walls, which are a rather unfortunate result of an internal effect. In order to create a large open floor plan, the lift shafts and stairs which normally sit at the centre of the building are now on the edges, which also means they block off some of the external wall space, right down to the ground level. That also means there’s less window space, and what space there is has been covered partially in the building’s other distinctive design feature, the hand-patinated Japanese bronze fins. The fins on the facade filter noise and sunlight, drawing in air through vents which then airs the office within, without the need for staff opening windows. The uprights which would usually be steel are Derbyshire sandstone. At the ground level, the finish is exemplary, with softly curved corners and a subtle use of granite in the pavement to give them a modest border. I often find that a building is defined more by the details than the mass, and whereas for example The Shard looks like a fairly ordinary glass and steel lump at street level, Foster buildings, such as the Bloomberg building and the Gherkin put a lot of effort into the way the building’s sit on the ground. Here’s there’s polished detailing, a sloping stone base around the offices and a lot of public realm space around the edges. It needn’t have looked like this though. The site had planning permission for a series of buildings up to 22 storeys high, but when that developer pulled out in 2009, Bloomberg came in with a more modest sized 10 storey high building. It still has the same floor space as the main tower at Canary Wharf though. Much is being made of the building’s eco-credentials, with the lowest operational carbon footprint in an office block in recent years. However, with the bronze being imported from Japan and the granite from India, the construction is less green than the operational claims. A large glass roof helps offset the lack of daylight from the side windows, but also means a lost opportunity for a green roof in the area. The exterior is all that we ordinary folk will ordinarily see, but I suspect that the interior, which is reportedly amazing will put the building very high up the desirability list for Open House Weekend next September. Before that though, two extra parts of the building will be opening soon – the Temple of Mirthras museum next month, and in December, a new tube station entrance down to the Waterloo & City line platforms in Bank tube station. I remember the old Bloomberg London HQ in Old Queen Street at the start of the millennium. Their presence here has grown immensely. The new building is bold, and perhaps will date – who can say? – but I like it. Like the Barbican, they have been bold, and used really high quality materials, which will only help to keep it looking good even if the style may pass. Nice article on it – thank you! I work very close by, and whilst I’m not the biggest fan of the style (purely subjective opinion) it’s a lot better than what came before, and it should last a long time too. I’m glad it’s finished, because it’s been a lot of construction over the past few years.